- We had one or two technical issues tonight. The weather was clear and conditions photometric. - We did not open this evening. Had some snow at the start of the night and sub-zero temperatures, this made for icy conditions. - We did not open, the entire night was lost to bad weather. but with strong wind, bad seeing and high humidity at the end. Were closed by humidity at about 3am. => Night with unstable weather conditions and moderate seeing. Were closed by humidity about two hours before twilight. As part of multi-observatory observations of V1369 Cen, Patrick Woudt obtained a High Resolution Spectrograph observations of V1369 Cen under 2014-1-DDT-002. The HRS observations covered data down to 370 nm and Neon lines in the blue showed similar profiles to lines observed in the far-UV by the Hubble Space Telescope. The data was processed with the new, but still experimental, HRS data reduction pipeline--stay tuned for more information about that. The telegram marks some of the first data presented for HRS observations. Click here for the full Astronomer's Telegram. Example of the preliminary HRS data reductions for V1369 Cen. This presents a normalized spectrum for the object with the different orders from HRS stitched together. 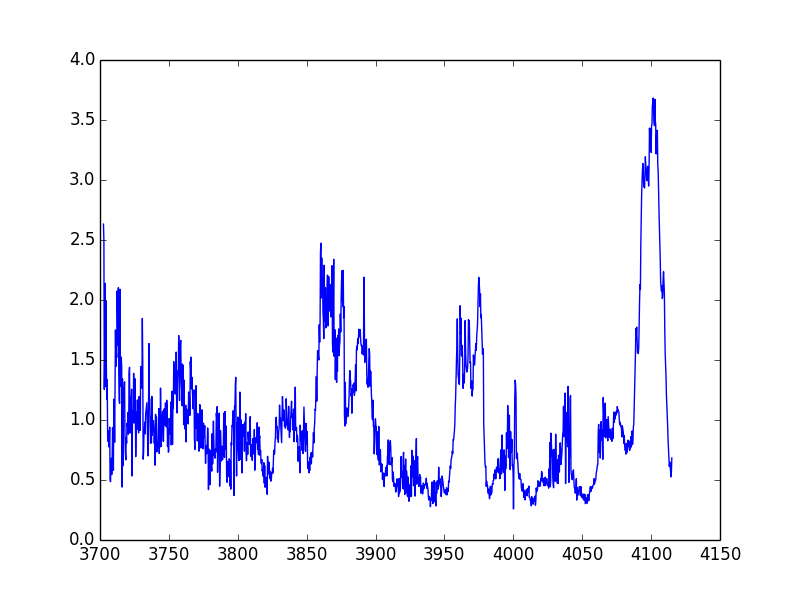 This is only a portion of the data available from HRS, but an example of some of the observations. => Stable night with good seeing. Others: Jonathan, Paul. Francois and Lisa from a distance. be in our control. Finally got going before 2am, but only limped along. A good productive night until 1 am when had to close due to humidity. High priority science with HRS and RSS and some successful BVIT commissioning observations. A productive mostly clear bright night. Stopped in our tracks soon after 4 am with a tracker problems. High humidity and clouds tonight. No observations taken. Heavy clouds and/or high humidity for most of tonight. Technical problems meant no science data could be taken in the small possible windows available. High humidity all night and thick clouds at times. No observations tonight. A night plagued by technical issues, cloud and high humidity. No observations made. A very frustrating night with several technical problems preventing us from making use of the few clear windows available in between some extensive cloud coverage. Whole night lost to humidity, could not open. Others: Keith twice to help with tracker faults. Partly cloudy night with a few technical problems preventing us from taking full . Others: David dB and Keith for a while. The night started cloudy, but it got progressively clearer and was lovely in the end. Others: Keith and Natasha for a little while. Laure remotely helping with TimDimm. A frustrating night at times, with banks of clouds passing by and a few technical issues, and lovely at others with OK seeing and relatively clear skies.